The Better Business Bureau (BBB) is a private, nonprofit company that offers accreditation to businesses that meet a standard of trustworthiness and quality. Companies with a “B” rating or better are eligible for accreditation; by securing this seal of approval, businesses may be more likely to attract quality-seeking consumers and increase sales. BBB also accepts customer reviews on its website. Securing positive customer reviews can be time-consuming, however. Fortunately, a tool like Podium will let you ask for and manage reviews across more than 20 online review sites, including the BBB, all from one dashboard. Watch the three-minute demo video to learn more. The BBB tracks more than 5.4 million businesses on BBB.org and assigns a rating to each, ranging from A+ to F. This rating system is based on 16 specific factors, including both factual information—like time in business and status of business licenses—and consumer feedback, including the number of consumer complaints, any pattern to those complaints, timely response to those complaints by the company, and other critical factors. Businesses that want BBB accreditation must complete an application and submit a copy of their business license and other information. Once all required information is received, the BBB will review internal and public records to determine the trustworthiness and reliability of the business. This review can take several weeks, after which time the local BBB board of directors, made up of area business leaders, chooses to either accredit or not accredit the business. Once a business is accredited, they have the ability to display the “BBB Accredited” logo on their business properties and websites. Most BBBs offer mediation and/or arbitration services to both accredited and non-accredited businesses; such services are often offered at no additional fee to BBB Accredited Businesses. These complaint settlement services provide a way to resolve customer disputes while precluding high legal costs. For businesses that are keen on establishing a reputation of quality while reaching a broader audience, accreditation by the BBB is often worth the cost. This accreditation can result in increased brand awareness and higher sales, while association with a non-biased, third-party rating site can increase the ROI of marketing campaigns. Each BBB has its own fee structure for businesses in their area. Those fees range from a few hundred dollars per year to thousands of dollars depending on the number of locations and employees a business has. Many BBBs offer fee arrangements from an annual fee to monthly fees. For more information, visit BBB.org. 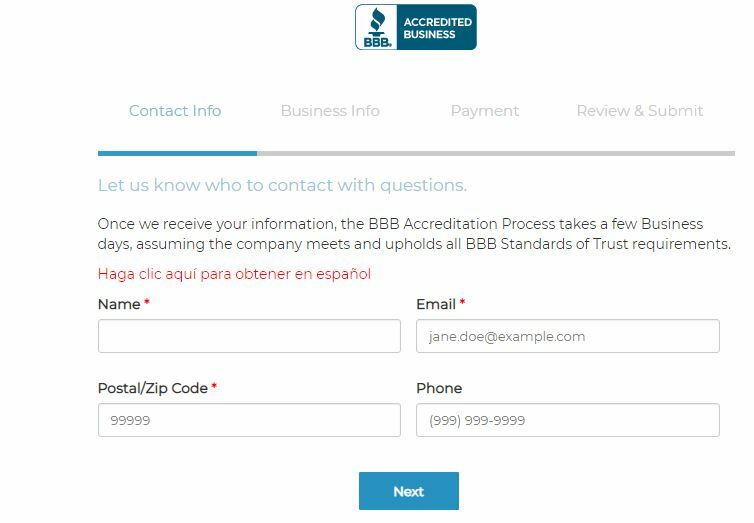 The process for securing BBB accreditation includes meeting the business standards of conduct that the BBB lists on their website, filling out the application, submitting a fee, and providing the proof needed to verify your application. Application review can take several weeks, after which time you will receive notice of your accreditation. Go to BBB.org/become-accredited to get started. Review the “Accreditation Standards” to understand accreditation requirements; confirm that your business meets all of them. While some of the criteria listed can be considered subjective, they are grounded on principles of trustworthiness, honesty, integrity, complaint-resolution, and prompt communication with customers. 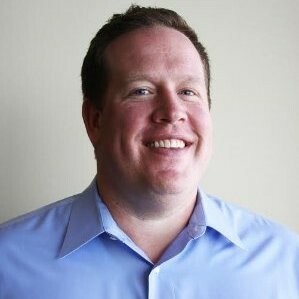 Build trust: Establish and maintain a positive track record in the marketplace. Advertise honestly: Adhere to established standards of advertising and selling. Tell the truth: Honestly represent products and services, including clear and adequate disclosures of all material terms. Be transparent: Openly identify the nature, location, and ownership of the business and clearly disclose all policies, guarantees, and procedures that bear on a customer’s decision to buy. Embody integrity: Approach all business dealings, marketplace transactions, and commitments with integrity. State the nature of the business: A business’s purpose and mission should be publicly transparent. Publicly include a physical address: In order to get BBB accreditation, a business must have a physical business address. FedEx and UPS addresses are accepted. Establish and maintain market trust: Businesses seeking accreditation must operate in the same location for over a year, meet all licensing and bonding requirements in their local jurisdiction, and avoid disciplinary government actions. Maintain consistent business operations: It should be clear how long a business has been in the marketplace. Changes in a business’s legal status or business operations can indicate instability. Maintain honesty and ethics in advertising practices: Businesses must comply with all governmental advertising laws and with the BBB Code of Advertising. Respond promptly to disputes: Businesses must make good faith efforts to respond to disputes raised with the BBB, including acceptance of BBB-recommended mediation, when necessary. Resolve complaints professionally: The BBB considers the number of complaints filed against a business and the way these complaints were handled or resolved over the life of the business. If complaints have not been handled expediently and professionally, it may affect the likelihood of accreditation. Safeguard customer privacy: Online businesses must disclose data security and privacy information on their websites. Businesses that collect sensitive data must comply with industry standards of protection and disposal of such information. Navigate to the BBB’s home page and click “Apply/Join” in the top navigation menu. This will bring up a form that will allow you to enter your basic business and contact information, such as business name, email address, ZIP code, and phone number. The BBB frames this as an initial “consultation” form, but it’s really just the first step in the application process. Once the BBB gets this form, they will send you the link to the complete application. Click on the link sent by email to complete your application. 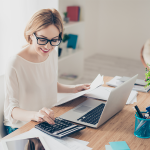 Fill in all required fields, including business name, the legal business structure (limited liability company, S corporation, or other classification), number of employees, and years in business. Be certain that the information you are providing is complete and accurate as of the date of the application, and that the application is filled out in its entirety. Once your application is received, the BBB will review the form, evaluate the information provided, and research the business using internal and public records. As necessary, they will contact you and request additional information to complete the review. Once the evaluation is done, the BBB will decide whether or not to accredit a business. This is announced via physical letter and email. Accredited businesses are also listed in the BBB’s online directory. If your business is denied accreditation, the BBB will mail you a letter telling you why you were denied, the time frame to wait before you can re-apply, and what steps you can take to increase the chances of securing accreditation in the future. Once the BBB has approved your application, you must then pay the accreditation fee. Payment simply requires acceptance of the BBB’s accreditation via a link in the notification email, which will trigger an automatic payment. The fees for accreditation vary based on the size of your company, but your welcome letter will let you know what your fee is. After paying the fee, you will receive both a physical and a digital “BBB Accredited” logo. Businesses also receive a BBB logo with their grade rating. Begin promoting your accreditation and rating by adding the BBB logos to your website and in your physical location. You can access these logos at any time by logging in to the BBB dashboard using the username and password supplied with the accreditation letter. Additionally, you can download a button for your website to encourage customers to leave reviews on the BBB website. The BBB dashboard will also allow you to manage, respond to, and provide documentation regarding any customer complaints filed with BBB. Kabbage, a small business lender, is a great example of promotion using BBB accreditation. The business chose to put the BBB badge on their website’s home page in the footer—which means it is visible site wide. What Are the Advantages of Being BBB Accredited? The primary benefit of being accredited is that it increases trust with consumers. 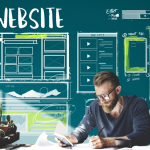 By going through the accreditation process and placing the seal on your website or storefront, customers and potential customers can immediately see that the business is committed to maintaining high-quality, ethical standards. This increases both sales and customer loyalty. How Is a Customer Complaint Handled on the BBB? First, the BBB contacts the company and asks them to verify that the consumer is actually a customer of the business. They then give the business 14 days to respond to the complaint. If the business does not respond, the BBB sends a follow-up and gives them an additional 14 days. Most businesses respond promptly and resolve their complaints. However, if BBB doesn’t hear back from the business, they close the case and the business’s lack of action is negatively reflected in their BBB rating. What Determines a Company’s BBB Rating? The letter grade (from A+ to F) represents BBB’s opinion of the business based on the information they have from the business itself and from its customers. The BBB also publishes details of complaints, minus personal information, so consumers can read for themselves the experiences of other customers and see how the business responded. BBB accreditation is a mark of trustworthiness and integrity sought after by businesses across all industries; it is based on 16 criteria defined by the BBB. As an indicator of exceptional quality, BBB accreditation increases customer loyalty and online visibility, likely increasing a business’s long-term sales. Positive customer reviews on BBB.org are critical to a company’s success. Unfortunately, many businesses don’t have time to track down reviews, which is why you should consider using Podium. Podium lets you ask for and manage customer reviews on more than 20 online review sites, including the BBB, all from one dashboard. Click here to learn more. I have a newly formed small business with relatively no business transaction history. How long should I wait before applying for BBB status? I wouldn’t apply at all. Save your money! You can apply any time because being a member of the BBB lets you include that information on your website and other marketing materials. That puts it in your customers’ mind and can encourage them to leave a review to help speed along accreditation. Hope this helps, good luck. I am a consumer and had a very bad experience with a business, and I am now taking that business to small claims court. I wrote a negative review and submitted it to the BBB – the business was not accredited and had no rating. The BBB posted my negative review – and then gave this business a 5 star rating FROM THE BBB!!! How is it possible thst a negative review generates a 5-star rating for a business???? The BBB has its own system and you can follow up with them following the outcome of your litigation if you feel it’s warranted. I hope you get the matter cleared up to your satisfaction. Good luck! what I would like to know is how does a competitors BBB for the past year was an F rating and now its an A with complaints filed in 2/18 and 3/11/18, we work very hard to keep our status rating with the BBB an this does not seam fair? The BBB does allow you to improve your rating by responding to customer complaints and making the situation right. In a sense, they expect some complaints to happen as a natural result of conducting business. As long as you address the problem, you are no longer penalized. So I imagine I need this explained again. A business can show an A+ rating with the BBB but not join and so is not accredited. What exactly does accredited mean and how does a business obtain an A+ rating – by applying to the BBB? What would be the downsides to working with a non-accredited company? Being accredited mainly means the business agrees to resolve any issues with customers, and will have a fully transparent relationship with the BBB should there be any inquiries. The accreditation code also stipulates a business will be honest with their advertising, protect customer data, and in general, maintain a trustworthy relationship with their customers and community. BBB ratings are based on actual data of customer complaints and resolutions. If you don’t have too many complaints, and always respond in a timely manner to complaints with a solid resolution, you will get a high rating. In this sense, BBB ratings can speak louder than simply being accredited, since a high rating shows that you’ve actually proven yourself in situations of customer distress. On the other hand, being BBB accredited shows you’ve made a promise to the organization that you’ll uphold certain values and work to resolve any issues. This is still reassuring to customers, since it shows a promise to resolve any future conflicts — not just a solid track record of past conduct.